The second Hearthstone World Championship will be held in late Fall 2015. Like last year 16 players are fighting for a total prize money of $ 250,000. The players have to qualify through 3 stages in order to particiapte at the main event of the Hearthstone World Championship 2015. The game has continued in its spiral of fame – going from famous to ultra-famous and has been tagged the most engrossing digital card game of the current year already – and from the looks of it the player base has no intention of stopping its growth for the next couple of years – at least. The game developers recently released some early information on the World Championship and how to qualify – here you can find a cohesive summary of all that information. The detailed schedule of the Hearthstone World Championship 2015 Finals at Blizzcon and the opening weekend is not available yet. There will be a dual-elimination Group Stage with 4 groups followed by KO-Stage with 8 player single elimination bracket. Deck lists of 3 decks used in each stage of the tournament have to bet submitted to the tournament administrators before the start of the event and each player’s card will be made public before the first match begins. Players can change their decks after each stage of the World Championship. According to the Conquest format every player has to win with all 3 decks in order to win a match. All matches are best of 5. After each game the winning players cannot use the winning deck for the remainder of the match. The loosing players can stay with the same deck or switch to another deck that has not won in this best of 5-series yet. The first round of World Championship main event will be structured as 4-dual groups of 4 players each, with the top 2 players from each group advancing to the second round of play in an 8 player single elimination bracket. Group seeding is decided by randomizing the players, with the 1st ranked players getting into a unique group and the 2nd ranked players in each group getting into a different group from that of their regional teammate. 3rd/4th rank players will be randomly assigned to groups that don’t already contain a player from their region. 16 Players qualified for the Hearthstone World Championship 2015. The players are coming from 4 different regions / qualifiers. Qualifiers are broadly broken down into 3 stages. Let’s go from top to bottom. As we know there are 4 players from each region – how are they decided? Through a regional championship tournament which consists of 8 players at the top of their region who will battle for a spot in the 4 seeds available. How are those 8 players decided? From a 40 player double elimination tournament. The top 8 obviously go and play the regional championship. How are those 40 players decided? From point structure in the season (basically your standings in the season). According to Blizzard the 8 players in the regional championship will not only play for a ticket to the WCS but moreover for a total prize money of $ 25,000 at each regional qualifier. Qualifiers follow a format similar to that of the World Championship itself, with obvious edits for the different amount of players in each tournament and as such, the necessary tournament style changes. There are plenty of different tournament rules though which you can read here. There are two ways you can earn points to start your world championship cruise. Points are based on ranked play during the season, or through blizzard sanctioned tournaments. Points are said to be awarded on performance, the better the result the higher the points gained. You will need a minimum of 2 points to be eligible for your regional last call tournament, which will take you to the regional qualifiers talked above. The top 23 players per region with highest points total will not need to play the last call tournament – so aim for the top of the league! That was the gist of it! There is still a lot of time left – Players can earn points until August the 31st 2015. All of the 16 players that qualified for the World Championship main event 2015 are already in the money and get at least $ 5,000. 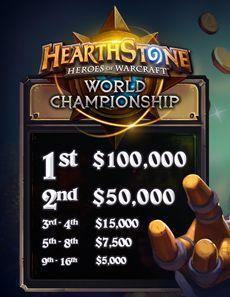 The winner takes the title Hearthstone World Champion 2015 and $ 100,000 in prize money. You can take a look of the complete prize money structure below. The 2015 World Championship of Hearthstone will be steamed live on various channels and in different languages. Moreover the regional championships will be streamed live too. You can watch the WCS Live stream right here on our website! Just press play to start the stream and tune in into the Hearthstone World Championship! The red button on the top right side indicates that the stream is live. All major eSports betting sites have lines and odds for the matches of the Hearthstone WCS 2015. We will release further information on the betting sites with lines for the World Championship in the future.